The Chikage is an excellent weapon for this fight, especially when set with gems that add rapid poison buildup to its attacks; the Repeating Pistol is also highly effective when used with Bone Marrow Ash and allows you to deal considerable damage from out of reach of most of the boss' attacks. Purchase a full load of Quicksilver Bullets and Blood Vials, and consider bringing 20 Poison Knives to take advantage of the boss' low poison resistance. 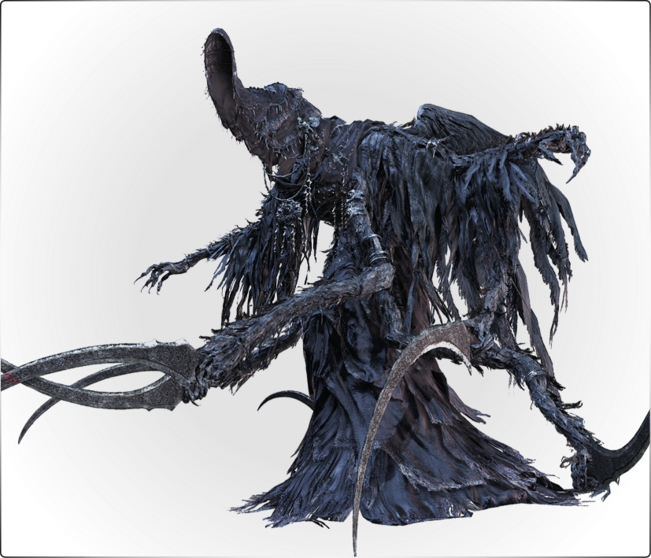 Mergo's Wet Nurse is a slow-moving enemy with predictable attacks, but hits like a freight train and has an astronomical amount of health. 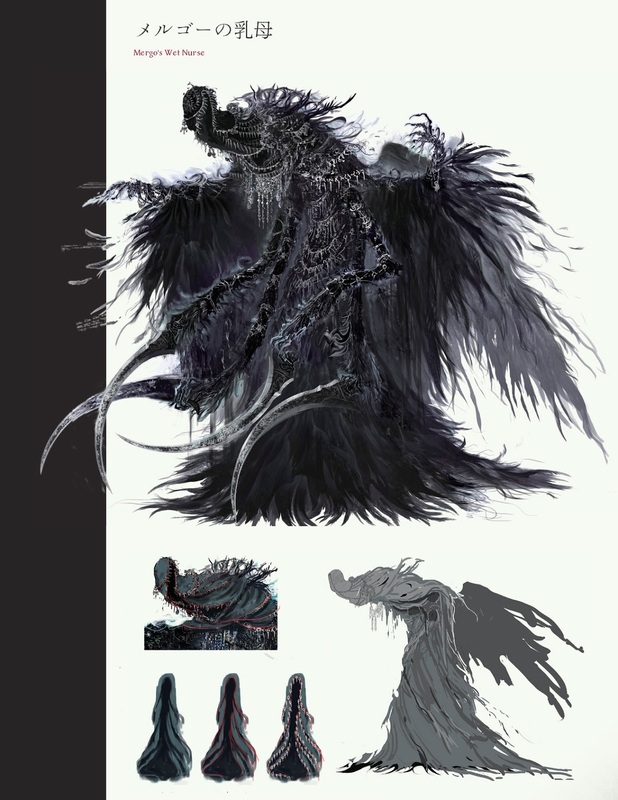 Apart from using its Blender Combo a bit more frequently and generally being slightly more aggressive in the second Phase, Mergo's Wet Nurse will attack in very much the same way throughout the battle. During Phase 1 its Nightmare Veil attack will create just as many problems for itself as it will for you - it won't be able to keep track of you in the darkness and will instead blindly attack the area in front of it, giving you a chance to hit it several times before the veil lifts. This technique becomes far more dangerous during Phase 2, at which point the boss will create a doppelganger of itself and both will actively hunt you down in the darkness. Most of its moves are heavily telegraphed and have lengthy recovery times, allowing you to quickstep in afterward and hit it before it can react. Mergo's Wet Nurse is unusually weak against poison, especially rapid poison, so make use of any gems you've collected to imbue your weapon with the effect before initiating the battle. Stay very close to the boss and circle or quickstep to its back when possible. None of its attacks hit behind it, which gives you ample opportunity to deal damage from its back. Being behind the boss when its Blender Combo starts gives you the largest opening to deal damage, but be sure to be directly behind it or you can be clipped by its flailing blades. During Nightmare Veil, keep moving and play defensively. Upon entering the arena Mergo's Wet Nurse will be moving very slowly towards you. She does not have any projectile moves making it safe to observe her first. When getting close to her she will do one of her close range scythe moves. Depending on which one she uses you can either dodge through her attack towards her or back away to be safe but unable to punish her with your melee weapon. The only move from her that is not punishable by quickstepping towards her is her Blender Combo, if she performs this move you need to back away. Usually the Blender Combo has three pulses. Every other move can be punished by quickstepping right through her attack and then countered by your melee attacks. You can only be hit by the scythes and not her arms itself, so by staying close to her you can dodge her moves and punish them at the same time very easily, meaning that the fight will be a lot faster done. 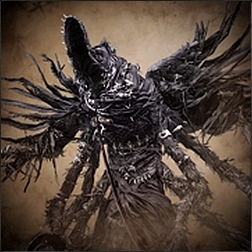 Mergo's Wet Nurse can be staggered if enough hits are applied in a short amount of time, doing this alone with out helping hunters is very difficult and not very advisable. The fight gets a lot more tensed when she activates her Nightmare Veil ability (although can be canceled look below for the attack list). Upon activating the whole arena will be covered in purple fog and a clone will spawn that continues to attack you. This ability can either be stalled out by running on the outsides of the arena and waiting for the fog to disappear or you can hit the clone as soon as it spawns which will make the clone disappear and afflict damage to the boss itself. 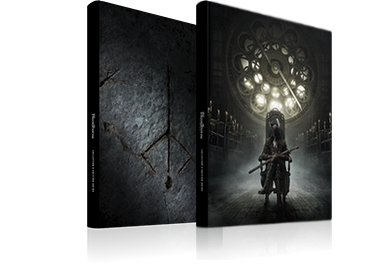 This is a little bit more risky since you will have to watch out for Mergo's Wet Nurse itself. But as long as you keep moving and destroying the clone while moving you will be safe most of the time. After the fog disappears you can continue to focus on the actual boss. Mergo's Wet Nurse inflicts a lot of damage with her delayed attacks which can catch you off guard, but all of them can either be dodged by dashing sideways or< by dashing right through her attack, which again, allows you to hit her for more damage. Most of her attacks are vertical or diagonal, meaning an unlocked roll diagonal to the opposite side will also allow you to punish her attacks easily. The battlefield has no obstacles and offers no cover at all, but its circular shape means you'll never become trapped in a corner and gives you plenty of room to maneuver. When the boss blankets the area in darkness during Phase 2 of the battle, the loft's circular shape actually works to your advantage - you can lead the boss around the perimeter while at the same time running out of range of the clone's constant attacks from the side. Defeating Wet Nurse will trigger Late Blood Moon (end-game) in Hunter's Dream, Mergo's Nurse's Lunarium lamp will spawn and Blood Rock opens for purchase at Insight Bath Messengers. Wet Nurse along with Moon Presence and Orphan of Kos have text upon their defeat "Nightmare Slain" instead of "Prey Slaughtered". 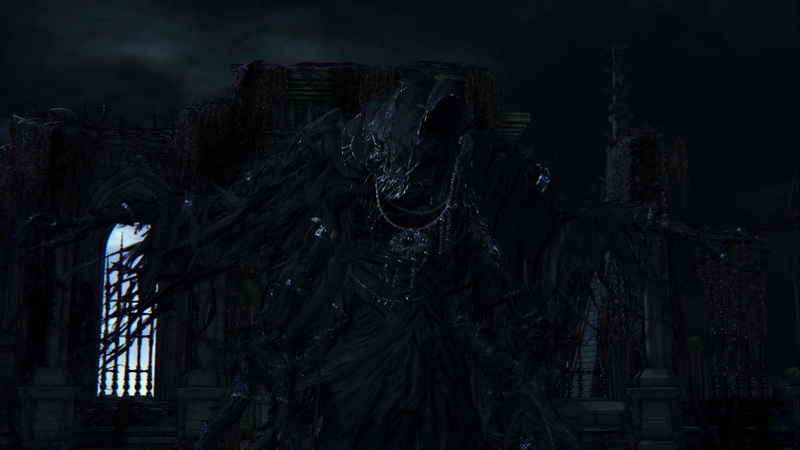 After Nurse defeat, you can return to Yharnam, Pthumerian Queen and she will bow to you and disappear. If you use Tiny Music Box during the fight, Mergo's Wet Nurse will sidestep as if you would attack it. Uppercut Slash No Heavily-delayed upward diagonal launcher; strikes its left side and directly in front of it. Quickstep backward during the delay or clockwise if close. Downward Slash No Heavily-delayed frontal overhead slash with all arms at once; quickstep backward once or sideways up to twice. Flying Slash No Long-range gliding horizontal scissor slash; quickstep forward as late as possible. Cross Combo No Slow combo composed of three delayed slashes with slight forward momentum; quickstep clockwise toward it through the first attack. Teleport Ambush No Folds its wings and vanishes; appears elsewhere in arena a few seconds later, ambushing you with a Flying Slash if you're close enough. Back up against a wall so you can see the entire room and respond according to its distance from you. Nightmare Veil No Blankets the arena in darkness, drastically reducing visibility. Cannot be cancelled or dispelled early; keep moving and wait until it wears off. Speedrunning Strategy: When Wet Nurse lifts its arms up there will be the purple ring above its head, the second you see the ring to appear you have to double dash either to the right or left while locked on and it will cancel the move. You can do it without the lock on but it will not be as consistent. Nightmare Blades No Only used while Nightmare Veil is in effect. Long-range stab attacks with stretched arms; roll or quickstep sideways, or run out of its reach. Phase 1 Strategy: Don't let the boss' slow movements tempt you to rush in and attack carelessly - its combo attacks have unusual delays that can be difficult to anticipate until you've seen them a few times and become accustomed to their timing. Focus on dodging through its attacks and working your way directly behind the boss. You can get attacks in from its side, but you'll need to get behind it quickly if it starts using its Blender Combo. If you get clipped, remain calm and use Regain to recover small hits taken. Deathly Duo No Used only while Nightmare Veil is in effect. Summons a clone that attacks from beside you at regular intervals; dash counterclockwise along the edge of the arena and don't stop moving until effects ends. Phase 2 Strategy: The second Phase begins when the boss' health falls below 70%, though its basic attack patterns won't change drastically until it uses Nightmare Veil. Continue to fight in the same manner as you did during Phase 1 until it initiates the Phase 2 version of this technique, then immediately disengage and dash counterclockwise around the perimeter of the room. As long as you keep moving and don't get stuck on the columns or staircases, the real boss will never catch up to you and the doppelganger's attacks won't be able to track you fast enough to keep up with your position. Manage your stamina carefully during this time and continue sprinting until the Nightmare Veil wears off, then resume the strategies outlined in Phase 1.